Alan Cotton works principally in oils, enjoying the sensuous nature of the medium and skilfully exploiting the use of various marks and surface effects to suggest different elements of the landscape, and convey a sense of light and space. A notable feature of his work is its bold, textural quality, which is achieved mainly with painting knives rather than brushes. Selecting perhaps just four or five different painting knives from his collection of over 100, he is able to create an impressive range of sensitive, expressive marks, resulting in landscapes of immense power and impact. Just as various aspects of Alan's working method are distinctly individual, so is the palette he uses. Because he works with painting knives a conventional palette is unsuitable - it simply would not allow him sufficient space to spread, mix and experiment with colours in the way that he likes. Instead, in the studio his palette is a sheet of hardboard, which is cut to fit the top of an old table. This 'palette' is an ideal size and has the added advantage that it is disposable. When, after a week or so, the hardboard becomes so saturated with paint that it is difficult to mix colours properly, Alan swaps it for a new sheet. "Although I may start with some kind of sequence of colours round the edge of the palette, within minutes it starts to look chaotic, at least to the outsider," Alan explains. "This is because I tend to select and mix colours in an intuitive manner, with plenty of freedom and expression. Generally, once a painting is in progress the colour sequence is determined by what is already on the canvas. However, the way that we arrive at a certain colour mix, adding a touch of one colour and perhaps a slightly greater amount of another, and the order in which we add these colours, is essentially intuitive, I think. 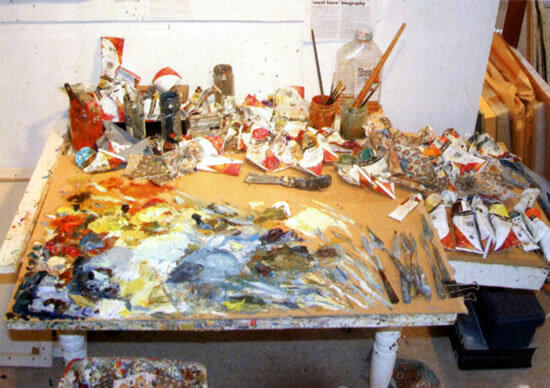 "I do not work with a set range of colours: the choice depends on the subject matter. I travel widely to find interesting landscape subjects and naturally the intensity and range of colours varies from one country to another. For instance, when I painted in Morocco four years ago, the colours were so utterly different from anywhere I had been before that I had to request additional colours to be sent from England - Indian red, light red, raw sienna and so on. 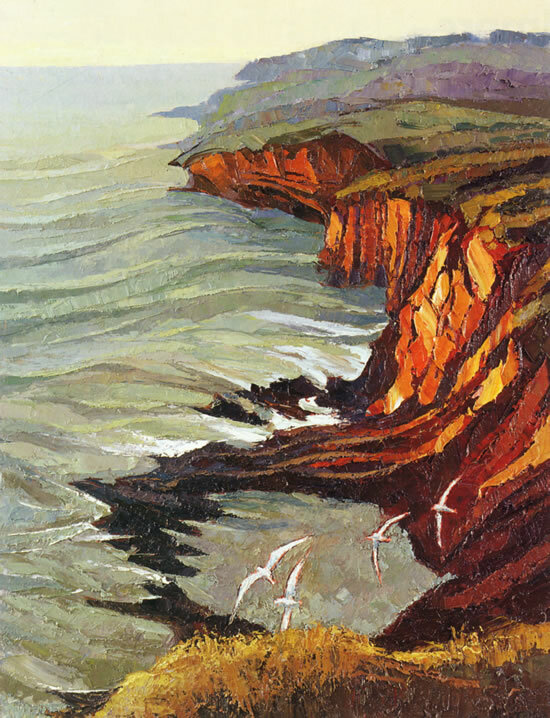 "Soaring Albatrosses near Taiaroa Head (shown below) was one of a number of paintings inspired by a visit to the colony of royal albatrosses at Taiaroa Bay, on South Island, New Zealand. Seeing these graceful birds gliding around this spectacular headland was one of the highlights of my visit to this part of the world, when I travelled as tour artist with HRH Prince of Wales on his trip to Sri Lanka, Australia, New Zealand and Fiji in 2005. These high-energy paintings generated a large variety of marks, while to express the landscape forms I was able to use rich areas of impasto pigment. My palette for this painting included Naples yellow, lemon yellow, cadmium orange, chrome orange, vermilion, raw umber and permanent mauve for the cliffs; Prussian blue, cerulean blue and terre verte for the sea; and titanium white for the albatrosses." On location Alan makes numerous reference drawings and also produces some paintings - working from a box easel and using a sheet of board as a palette, though of course this is smaller than the studio version. Because he uses mainly painting knives he likes the paint to have plenty of body, to be "as dense as it comes", and consequently he mixes it straight from the tube, without the addition of any diluents. Drawing is fundamental to his work and he always starts a painting by drawing on the white canvas. "There is something very special about drawing on a white canvas," he says, "but I realise the white surface can also be inhibiting. So, when there is enough drawing in place, I cover the whole canvas with a transparent colour wash. This gives me a mid-tone ground to work on, with the drawing showing through. The ground colour varies to suit the subject, although recently I have preferred quite strong red/brown grounds. After working with brushes for the initial stage, I begin to develop the painting using the painting knives. "The painting knife is a surprisingly versatile tool. By varying the pressure or the amount of paint on the knife, or using a slight change of angle, you can make every kind of mark, from precise lines to broad sweeps of colour. Moreover, it is easy to scrape off paint and rework areas, and I might refresh the palette in this way - certainly I do waste a lot of paint. But my view is that paint is there to be enjoyed. I strongly believe that rather than being nervous about the process, if you work with obvious enjoyment and imagination, those qualities will come through in the paintings and lead to much more positive and successful results." "The Artist's Palette - Alan Cotton"
All rights of the original author reserved.